Anyways it has about 20 something layers... I altered the colors of some of the scans I used... Nonetheless, I hope you like it! Disclaimer: The images I used are not mine... they are all original art work of the game. Good wall, good job with it. The game is not one of my favs but its a good game. I;m waiting for Reesident Evil 4 to be released on PS2 at the end of this year! anyway I wanna thank you for making this good quality wallpaper which I really like! Hmm....the scan don't go well with the BG. Try fixing up the brightness/contrast for the guy. Overall, it's a pretty and different kinda wall from you. Don't see it much around here. Wow, absolutely awsome wall. :D Nice scene and the scan looks so cool. I don't know the game, but the wallpaper loooks great! My favorite Resident evil ,good job!!!! 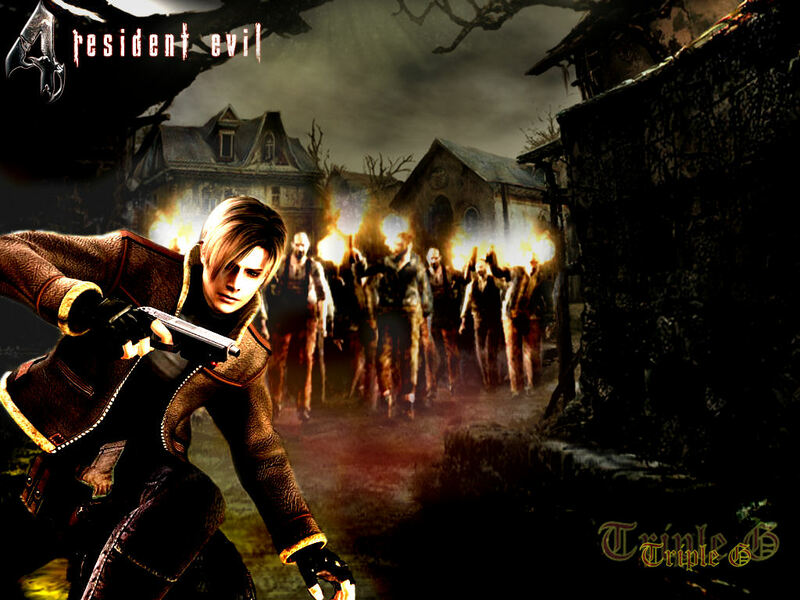 So nice, resident evil 4! this is the game version! very nice picturee! it is one of my favorites yooo!